With a light herbal-y scent, California Baby's Calendula Lotion works to soothe and heal skin naturally—so effective that we call it, Nature's First-Aid. Calendula (kal' len' dula) is commonly known as the common Pot Marigold flower and has been used to safely soothe and heal skin for centuries. Infused with vitamin E, aloe vera, and rosehips that are blended into high quality, cold pressed vegetable oils that are non-greasy and absorb quickly. California Baby's silky smooth Calendula Everyday Lotion is lightweight and applies quickly leaving the skin with a long-lasting satiny finish. Gentle enough for everyday use. Beautifully scented with our Calming blend of essential oils that include French lavender, which works to unwind the body and promote calmness - an excellent bed or naptime massage lotion. We use only the finest quality, traditionally recommended oils that are safe, gentle, and effective. Our essential oils are sustainably grown. Keep skin healthy and make this part of an after shower or bath routine! Recommended for those with sensitive, irritated or extremely dry skin; helps to soothe dermatitis, eczema, and cradle cap. 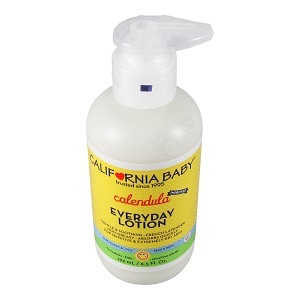 Calendula Everyday Lotion - For Sensitive & Dry Skin, 6.5 oz is shipped in a discrete, unmarked package. Orders are processed immediately and usually takes about 3 to 5 working days to be received. We do ask that you try it for 2 to 3 weeks to feel the full effects. Any information received is used only for order processing and shipping purposes. Your information, such as e-mail address, will never be disclosed to a third party.